Almost every woman in every country will face sexual harrassment in her lifetime. But in cities like Hanoi, Vietnam, it's widespread and constant. Ngoc was still a child when the daily leers and catcalls began. At 15, they escalated. While waiting for an exam in Hanoi, a man pulled over his car, staggered towards her and exposed himself. Terrified, Ngoc ran until she could no longer see him. What happened to Ngoc is horrifying and unacceptable. But it's preventable. 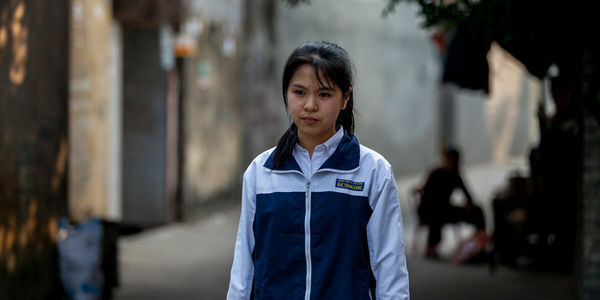 Through our programs, Plan International Australia empowers girls like Ngoc to know their rights to safety and move freely about the city without fear. In Hanoi, we provide girls with basic self-defence training, and work with boys in their classes to encourage healthy, respectful relationships. We're changing attitudes around sexual harassment and violence right across the city — for example a live radio broadcast on public transport is educating passengers every day, and we're partnering with local governments and policy makers to prioritise ending sexual harassment.